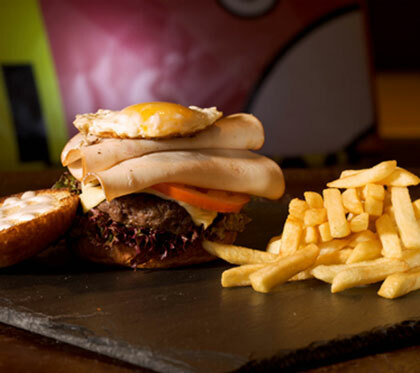 Burger Rebel is a culinary rebellion against the conventional, reinventing the common burger, slider and hot dog by giving them a 21st-century makeover with a rock 'n' roll' edge. We at Burger Rebel are passionate about food and innovation and really do not like being told that "everything has been done" and that "the burger is "so over"; or that they belong only in the realm of junk food. We reject that notion and have created a new approach to popular food, pairing quality with a daring use of uncommon ingredients. Culinary talent and ingenuity are not the sole proprietorship of star chefs and pricey restaurants. Culinary adventurism for all! You can download menu in pdf format here. All burgers are ground in-house from a fine selection of beef brisket and chuck. Our hotdogs are actually handcrafted sausages, ground, spiced, flavored and formed in our own kitchen. All buns are baked here at Burger Rebel and placed on the grill where they get their distinctive center spot. All of our delicious sauces relishes and marmalades are homemade. And side dishes are hand cut and cooked or prepared here at Burger Rebel.